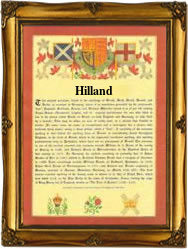 Recorded as Highland, Highlands, Hiland, Hilland, Hyland, and Hylands, this interesting surname is of Anglo-Saxon origins. It is topographical for someone who lived on a patch of high ground, or perhaps locational from one of the various villages called Highland, High Lands, or Highlands, found in various parts of the British Isles. The derivation is from the Old English word 'heah', meaning high with 'land', Early examples of the surname development include: Wulford atte Highelonde in the Hundred Rolls of Kent in 1275, and Thomas de Heyeland in the Pipe Rolls of the county of Sussex in the same year. Locational and topographical surnames were amongst the earliest to be created as places and features in the landscape, both man made and natural, provided obvious and convenient means of identification. The first recorded spelling of the family name is shown to be that of Nicholas de Haylaund. This was dated 1255, in the Assize Rolls of Somerset, during the reign of King Henry 111rd of England, 1216 - 1272. Surnames became necessary when governments introduced personal taxation. In England this was sometimes known as the Poll Tax. Throughout the centuries, surnames in every country have continued to "develop" often leading to astonishing variants of the original spelling.